What happens when I publish a Windows Phone ‘Mango’ application update? The opening of the Windows Phone Marketplace for Windows Phone Mango is drawing near! We’ve blogged recently about all of all of the amazing new things you can do in Windows Phone ‘Mango’ and we’ve also mentioned that we encourage developers to test their existing applications against the Windows Phone ‘Mango’ tools. As we get closer, some people are asking us: what happens to their existing applications once they submit an update for Windows Phone ‘Mango?’ How will my update appear across the full scope of all Windows Phone users? Because metadata is now shared across the multiple versions of your application that may be available, you should be very clear when writing, or updating, your detailed description about any features that may be available to users of only one specific version. For a comprehensive list of the new developer features in Windows Phone ‘Mango’ for which you’d want to do this, see the article ‘What’s New in the SDK’ on the MSDN Library. We also strongly recommend that in your description, you include a link to our Windows Phone Update Information website, at http://wpupgrade.ms/mangome. This will provide users who have not updated to Windows Phone ‘Mango’ an easy way to get more information about updating their phone and getting access to the Mango version of your app. 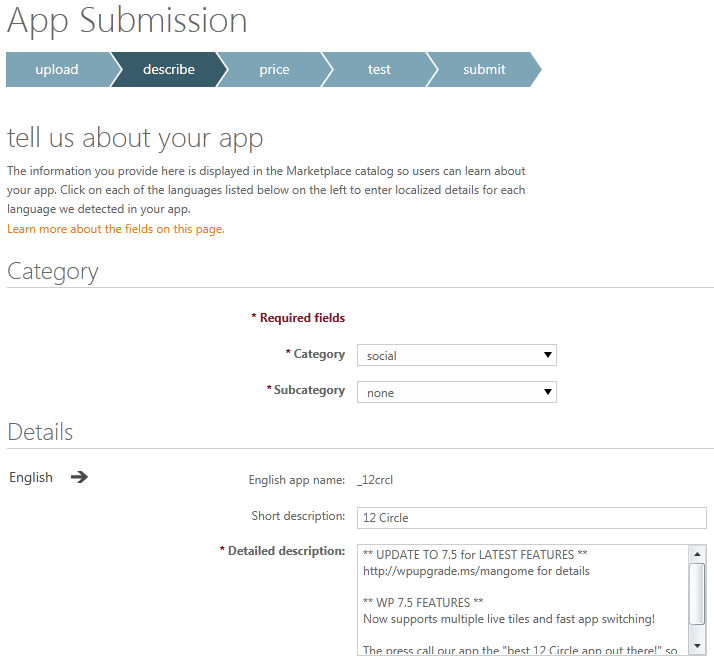 Further, if you are publishing a screenshot that demonstrates functionality only available in the ‘Mango’ version of your application, we recommend that you make this very clear by adding a text overlay “WP 7.5 Only” on each appropriate screenshot. In the screenshot below, we’ve got an example of how you might implement these suggestions in the App Submission page on App Hub. We’re incredibly excited to start seeing the applications and games that people are building for Windows Phone ‘Mango.’ ‘Mango’ brings a large number of new features to developers that we’re incredibly excited about, like Fast Application Switching, Multiple Live Tiles, Background Agents, Socket support, SQL CE, Camera stream access, and more! We want to make certain that developers have the information they need in order to build and publish applications as quickly as possible! Thank you for your continued support. Previous Previous post: Windows Phone Mango change, Listbox: How to detect compression(end of scroll) states ?